You forgot to download The Uniform Server	. Click the link below to download it. If you are a web designer or a web programmer, you surely know that running a website requires a server and some hosting space. Companies that offer web hosting services are many, but few truly comply with the user preferences and needs. Not to mention that you pay for services that you don't need, just because the web hosting package includes them. For many hosting companies, the support system doesn't work as it should and, thus, a problem takes a lot of time to get its answer. That's why it would be a good idea to host a website yourself. This way, you will have only the services you need and you can configure them just the way you want to. 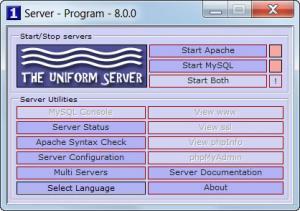 A good starting point for that is the program The Uniform Server. This is basically an application that includes a web server and a database server. It's all you need to create a quality website. The software is distributed as a self-extracting archive and the user only needs to set the extraction directory. That's all. The Uniform Server supports every version of Windows. It can be run either as a program, or as a service. Closing the program's window while running as a server will not stop the services. The user has the possibility to start the web server, the database server or both, according to his needs. The web server can be thoroughly configured using the program's settings or by manually editing the configuration file. Also, the interface features an option for checking the status of the server, to easily find a problem, in case it occurs. The program's documentation explains in detail every aspect of The Uniform Server, so even beginners that don't pose any knowledge about servers and networks can use the software without problems. Still, configuring the server configuration file requires some server background. All the website files must be placed in the www folder, for the site to work. Besides including a database server, the program also features other options, like securing the website using SSL, but again, this requires more advanced knowledge. It can help even beginners run their own website in no time. Also, the help manual explains in detail every aspect of the program, so everyone can understand how it works. The options are a bit too simple for an experienced user and the configuration possibilities are limited. The Uniform Server is a great program for running your own server in no time and with minimum effort. You can download The Uniform Server free here.